Aaaaaah France! You Are So Lovely! words in the English language." Have been meaning to blog, but have been itchy, itchy, itchy! We went out to a new restaurant and I had some of the best oysters I have EVER eaten. Well....I am paying for it! I knew I was allergic to shellfish, so I only eat shrimp occasionally. But oysters? I-YI-YI! I am a huge walking rash! No sunburn, but an oyster burn! It has been hot, hot, hot down here! We have finally had a much needed rain today. We have all been able to catch up on our reading and just enjoy being together. who had oysters a plenty. When my parents purchased their cottage in Grayton Beach, they wanted to come up with an appropriate name for the cottage. We all started brainstorming trying to come up with what the cottage meant to us all. Finally, we all settled on "Repose Cottage." The Webster dictionary defines repose as, to lay at rest, a state of resting after exertion or strain: to induce ease and relaxation: peace, tranquility. All have found repose again." 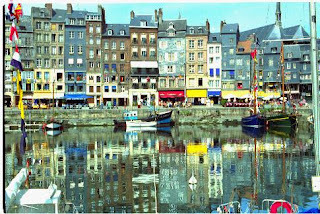 Honfleur is a quaint seaside French village we visited in the Normandy region. The oldest known wooden church, St. Catherine, is here. It was built in the 1300's and the roof looks like a Viking ship turned upside down. So many cathedrals burn and it is amazing that this one has lasted so long. The musical composer Eric Satee is also from this village. Mandy was excited about walking past his birthplace, as she had played a couple of his pieces in the past. Some of the best hot chocolate Savannah and I had was from Honfleur. They are also known for their apple cider and calvados that the WWII serviceman would drink to help keep warm. A lovely cobblestoned French village! The other night DH and I were cuddling and he thought he saw something in my hair and began reaching for it. I said, "Is it a piece of lint? Did you get it? Ouch!" He said, "Uhhh, it was a 'discolored' hair." I said, "What? You mean a grey?" "Yeah." Talk about protecting himself from getting in trouble! I got so tickled! I don't mind having a few greys and I do have a few. There were days in the past that I was not sure if I would be alive for grey hair. I love my discolored hair! Our tour director, Eric, was a cute young Frenchman who had been with the company for nine years. He is an artist/stone carver in his spare time and you could tell he enjoyed history. He was very brave taking on 23 Southern women along with 25 other kids and parents from Denver. Of course we all ended up being his favorite group of the two. Eric told us that his great grandmother had thrown the artist Paul Gauguin out of her house, because as a boarder, he was always late with his rent. She therefore, alas, threw his paitings to the curb for trash when he left. He explained that this was why he was a tour director now. Our bus driver Phillipe was also a kind, careful and attentive driver. Last year we had a doozy who would fly right up to the car in front and slam on the breaks and sling us all forward. He would curse at the drivers around him too. Thanks Phillipe! All our hotels had hair dryers in the rooms except for the smallest one. I always think that is a good sign when the hotel has a hair dryer. Our one mistake was finding out that we needed to call down to the main desk to have them turn on our air conditioning. It's off unless you request it. We did not know this until we were checking out. So there were some stuffy noses from having the window open and it being so hot. But all the hotels were nice, clean and good locations. Eric taught us all how to read the metro (train) maps so we would be able to get around Paris on our own when our free day came around. And of course we all did perfectly! We didn't get lost once! We're back!!! What a FABULOUS trip it turned out to be too! 10 days was just perfect. Yesterday Savannah and I were up and flew most of the day. DH says we were up a total of 25 hours before we went to sleep last night! It was good to see him, Mom and Dad waiting for us when we got off the plane. I made some amazing pictures and will get them loaded on the computer as soon as I can. The company, weather, cities, villages, museums, cathedrals and memorials we visited were all incredible! Leslie, Savannah and I all enjoyed the time we got to spend together just visiting, catching up and giggling over silly things that would happen. My favorite part of the trip? I would have to say all of us walking down a quaint street in a little beach village to walk in the sand and search for shells and put our feet into the "French" English channel tide. The visit to Saint Chappelle cathedral and the Opera house would have to be close 2nd and 3rd. Mandy may have her pictures up sooner than me, so be sure and click on her link down below to check. We found the French people extremely gracious and very polite to us. The secret is to be polite to them like we should be anyway and just "try" to speak those important words....hello, thank you, pardon me and goodbye and your experience will be extremely positive and you will think, "Hey! I CAN do this foreign language thing!" In Peachtree City relaxing before the big trip tomorrow. We said our goodbyes to Mom, Dad and the pups in Grayton Beach this morning and DH took us to the airport, kissed us goodbye and we headed to Atlanta and he home to Tennessee. Les and the kids picked us up and we all headed to the Varsity for lunch and a yummy frozen orange. Les dropped us off at Mom and Dad's, since I am allergic to her cat, and we are spending the night here. We will borrow moms car if we need to run around and to go to church in the morning. Leslie says that Ashton Kutcher and Demi Moore are leasing a house down the street from her while he is making a movie in the area and he has been spotted driving around in a convertible...maybe we will run into them out and about! I'll try to blog whenever there is a computer available, otherwise I'm sure there will be lots of pictures to share when we get back! Just hanging out now listening to 'Prairie Home Companion' radio show and will turn in early tonight I'm sure. Happy travels! The ocean was roaring this morning after an evening of rain and wind. The waves were crashing and the red flag was out warning of riptide. But oh what a beautiful picture it makes! People were still out lounging and reading books, flying kites and getting their feet wet in the surf. The children are all playing in the 'wash out', which is the water connection between the lake and the gulf that is the calm area to play in. Mothers are able to sit back and not worry about their little one getting knocked down by a big wave. With the breeze, it does not feel like June here...not hot at all. But you can forget having a hair-do, as we say in the southern states. The humidity and wind will whip it up into a frizzy before you know it! I love seeing all the sandals and shoes at the end of the walk way before you step onto the beach. There is still trust here. When you leave your shoes, you trust that they will still be there when you come back. Shoes and sandals of every kind....big feet and little bitty feet leave their shoes here in the joy of taking that first step onto the soft white sand. We are busy, busy, busy around here! I have zipped my suitcase closed because I cannot fit another thing in it! Of course I have too many things packed and may pull some things out when I get to Florida and let mom look through it. She'll have some idea of what I need and what I do not. Savannah has had a fun day with her friends working a charity golf tournament. They spent the night together and Muffy said they were quite loud and up pretty late. Teenagers.... It was hot with it hitting 93 degrees at the hottest part of the day. But they are young and ignore such things when they are together having fun. She came home this afternoon happy and said she was "glistening." That's my 'Southern' girl! Never sweat, just glisten! This past week we drove two hours with DH's parents to have a yummy dinner and spent some great time together, ran into Clare and Elaine here in town and it was sooo good to see them and tomorrow I'll have breakfast with Jodie. She has new Grandmother and baby pictures to show me since she has been in Florida for the past two weeks helping her son and his wife with the baby. Precious and exhausting!! I will do my best to blog wherever I am!